My farm is a small farm in rainfed area and foothills. Due to the peculiar location of the farm I often faced the problem of no-water. Therefore cow dung and urine based manure and vermicompost are used extensively in the entire farm to keep the water requirement to minimum and at the same time boost plant growth as well as soil enrichment. Crops cultivated are ragi (millet), groundnuts, tur (pigeon pea), hyacinth bean, cow peas, pearl millet, hombalejola, etc. To have the bio-diversity in the farm growing trees is mandatory thus I planted 150 arecanut trees and 40-45 coconut trees. Farming is incomplete without cows so I have four desi cows for which fodder grass is also cultivated. 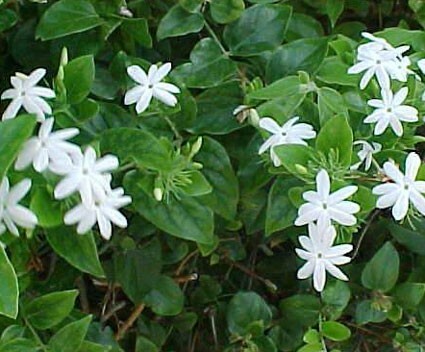 Flowers have good demand in the market so I choose to grow 150 jasminum multiform, 150jasmine and 20plants of marale. 150 saplings of Jasminum multiform planted 20years back are still flowering. It is one of the best profitable crops we have in our farm. It yields 2kgs flowers/5-6plants. Marale flower production is around 0.5kg -1kg flowers/ plant while Jasmine yield is 2.5kgs/plant. Jasminum multiform flowers 9months and 3months it will not blossom any flower. It flowers from June till March. Jasmine yields all-round the year. If the plant is well taken care of with cattle manure, scheduled irrigation, spray etc then flowers are produced for everyday harvest. Marale flowers are produced only for 4months. It starts by March and stops by rainy season. If it rains heavily, then this plants stop flowering. Jasminum multiform is grown keeping 8ftx8ft distance, Jasmine 4ft * 5ft distance and Marale plant is at 10ft distance. Intercropping is crucial for improving farm production and efficiency. Recently I planted 70 new plants of jasminum multiform. As these plants are still small to draw income from the farmland I cultivated chili of Mugul variety. This mugul variety of chili has more demand than regular chili and it fetches Rs. 20 more than the regular chili rate. It is harvested once in 7-15days. Jasminum multiform is also intercrop with arecanut. I have cultivated 150arecanut trees along with 150plants of jasminum multiform. Arecanut would take 6 years to yield while jasminum multiform yields within a year so it helps in earning money from the same piece of land. We cultivate 8rows of ragi, along with 1row tur, 1row of hyacinth beans, 1 row of cow peas, 1row of hombalejola and 1 row of pearl millet. These crops are alternated with 8rows of ragi. The distance between rows is 0.5ft or 0.75ft. In crop rotation, I use this 1acre land for groundnuts (local variety). The distance between rows is 1ft and seed to seed is 0.25ft to 0.5ft. We cultivate hyacinth beans, tur, cow peas, green gram and castor oil seeds as intercrops with groundnuts. Another issue related to water is soil erosion. At the time of high rainfall the soil is eroded so I top up the soil in my farmland with soil brought from nearby lake during summer. Even after making bunds we faced issue of soil erosion during heavy rains. Four years continuously we faced this problem so we resolved it by topping with lake soil. I have not come across pest and diseases in the farm much as preventive measures are taken. Arecanut tree are treated with slaked lime to avoid spoil of the trunk due to heat in summer. The trunk is painted if it gets too much exposed to sunlight. Farm produce is sold in different ways. Flowers are sold in Badavanahalli, Tumkur district. To get extra money we make flowers garlands and sell otherwise in case of no-time it is sold as plucked. Jasminum multiform is sold at Rs. 400-500/kg or even at Rs. 60/kg. it totally varies are the demand, for example during festivals the price appreciates quite a lot and in off-season it drops drastically too. Groundnut is sold in RMC yard Sira, or Madhugiri, Tumkur district. I get approximately 3-4quintals of arecanut. It is given for contract as they pay approximately Rs. 10, 000/quintal less than the market price. People come and harvest coconut and take at Rs. 12/piece. Ragi is sold at Rs. 500 -2000 depending on the market. However it might get stabilized now as government has fixed a price for ragi as Rs. 2,300. Milk is sold to KMF dairy for Rs. 28/litre. Farming is a profession that attracts people who love nature more than money. It gives good earnings if done with 100% sincerity because chances of failure are more than success. So think before joining this business!